<a href ='http://www.maui360tours.com/resorts/KoaResort/1d/index.html' target ='new'>CLICK HERE FOR A VIRTUAL TOUR</a>A beautiful tropical garden setting awaits you from this first floor location. The one bedroom one bath apartment has been upgraded and updated over the past two years. 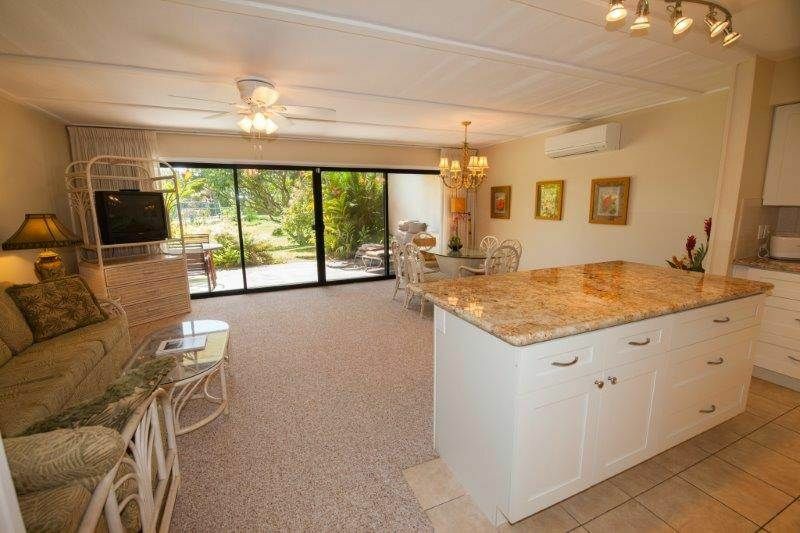 It has a spacious living/dining/kitchen area. The bedroom has a queen bed and there is a sleeper sofa in the living room. There is also a washer and dryer in the apartment. Koa Resort has a large swimming pool, hot tub, tennis courts and barbecue grills throughout the five acre landscaped grounds. The condo itself was pretty good, great size, all the basics for a short stay. Unfortunately while we were there the building we were staying in was having roofing done so every morning by 7:30-8:00am there was an incredible amount of banging. With the roofing there was also nails and garbage in front of the deck to watch out for with bare feet. Dishes were limited, but at least there was a dishwasher, some days if we required more plates or bowls we'd have to run it twice. The lawn furniture could be replaced, definitely the lounge chairs as they were to stinky to sit on. But even with that said if the roofing had not been going on, the deck was an awesome sunning spot and we enjoyed our week in Maui. This was a great home away from home for our holiday. It was clean and had everything we needed. The grounds were beautiful but could have been better lit at night. The bedroom bed was comfy and the bedroom was a decent size. Hide a bed in the living room wasn't very comfortable at all. Springy mattress...but we managed. The bathroom was large and shower was big too with good water pressure etc.. The pool was great. Very close to the unit and lots of available chairs to relax in. Water was good and the hot tub too. The realty place provides minimal soap (hands, laundry, dishes) but at least enough to get you started. A few rolls of toilet paper were provided...I think 2. Towels are nice and there was enough. No need to bring your own. All in all a fantastic place to stay at a decent price. The apartment was pretty clean and for everything that you need. The resort got swimming pool, nice garden, quiet and safe. Definetly I would stay here again. Good for the price - the apartment was well equipped, had AC, spacious. The back patio area opened to a lovely yard and easy walk to the pool.. Honestly my only issues were 1. the furniture felt really outdated, old, and grungy. I put a towel down on the couch before sitting on it. But otherwise everything else was clean (kitchen, bathroom, etc)...and 2. there are a bunch of crazy rules for the condo complex. It didn't seem to be a big deal in the end, but it kind of put us on edge during our stay (e.g. you aren't supposed to hang towels/bathing suits on furniture on the patio, etc).. this isn't really the rental company's issue but a con of the place. It didn't feel super walkable, but there's a beach access across the main street so it's relatively easy to get to the water. Not the nicest beach, but if you walk like 5-10min south on the beach it gets nicer. The instructions were straightforward, and the space was well air-conditioned. Since my wife and I don't really use the TV, the space was perfect for us. It's quite a safe haven and I think the amenities fit our needs. Perfect location and beautiful property. Just across the street from the beach. It was very clean and quiet at night. It had everything we needed for the beach and all the amenities you need. Perfect for a family of 4. We will definitely stay at this property again!